Located on the northern edge of Oakland County, Holly Recreation Area is a 7,817-acre state park that offers a wide variety of terrain on both sides of I-75. West side of the interstate Holly consists of fairly flat wooded lots, reverted orchards, tamarack swamp, small lakes and marsh bog. Areas east of the highway feature heavily forested hills, second growth forests, the largest lakes, more wetlands and open fields that at one time were farmed. In all, Holly has 17 lakes and a handful of creeks and 30 miles of trails for both hikers and mountain bikers located not much more than 30 minutes from the urban areas between Flint and Pontiac. Places to roam close to home. The park is actually seven separate units with most of them totally undeveloped and frequent mostly by hunters during the fall seasons. The largest, most developed and thus most heavily used area is east of I-75 and includes McGinnis Lake north of McGinnis Road and Heron, Valley and Wildwood lakes south of it. 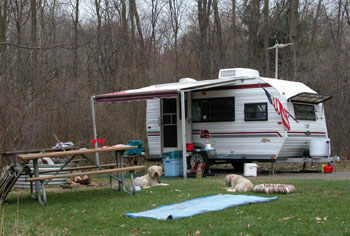 Surrounding the lakes are the park’s campground, beaches, day-use areas, rental cabin and even a disc golf course. 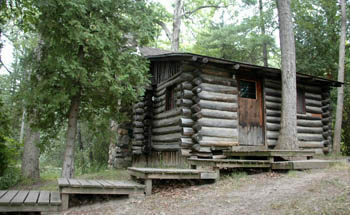 This unit also contains the park’s hiking trails. The excellent Wilderness Trail Is a nearly 6-mile hike through and over the rolling ridges that surround McGinnis Lake while the 2.4-mile Lakeshore Trail connects the day-use areas and beach around Heron, Valley and Wildwood Lakes. 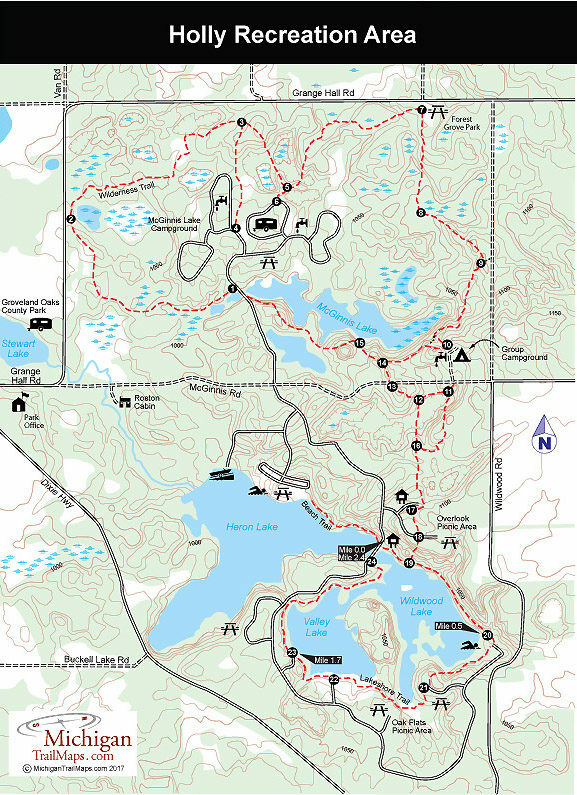 Located in the McGinnis Lake Campground is the half-mile Whispering Pines Nature Trail. In the 1994, mountain biking arrived at the park when volunteers from the Michigan Mountain Bike Association designed and constructed the Holdridge Lakes Mountain Area in a section of the park on the west side of I-75. What first began as a 7-mile trail system now totals more than 24 miles along three major loops. The East Loop or Gruber’s Grinder is an 18-mile advanced single track which includes log jumps and off-camber climbs. The West Long Loop is the most scenic ride, a 4-mile single track that winds past three marshy lakes and features a steep hill on its backside. Beginners head for the North Loop, a 2.25-mile, easy loop through woods and fields, while the 1-mile Tech Loop completes the system. Red Loop.